The Hungaroring isn't a place noted for overtaking. To be saddled with a 10-place grid penalty for an engine change and start 14th doesn't make a driver leap out if bed on race morning. 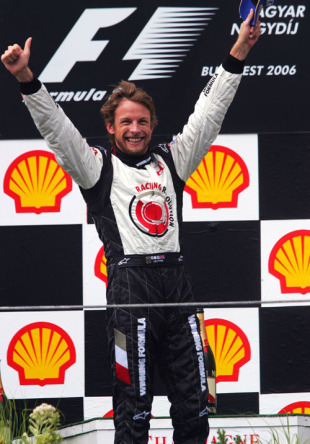 And yet, from such unpromising circumstances, Jenson Button won his maiden grand prix. Much of it was down to the right tyre choice and a splash of luck. Although McLaren's Kimi Raikkonen led from team-mate Pedro de la Rosa, Button was on the move and luck played into his hands. As Raikkonen was distracted by a radio conversation with a McLaren engineer, he crashed into the rear of backmarker Vitantonio Liuzzi. That brought out the safety car and many pitted. Button had pitted before the accident so jumped up the order and set off in pursuit of Fernando Alonso. They traded fast laps and after the second stops Button remained behind the Spaniard. After Alonso's final stop on lap 51, his race went south. The safety mechanism holding the right-rear wheel nut on didn't disengage in the pit stop and damaged the wheel nut. That sheared, off came the wheel and out went Alonso. Button now led and was on the right tyres for worsening weather. He was able to keep ahead and score his first win in a career that seemed to have stalled. De la Rosa, Juan Pablo Montoya's replacement, took second after a battle with Michael Schumacher that ended when De la Rosa squeezed by and Schumacher hit the back of Nick Heidfeld's BMW-Sauber who passed him a lap later. Schumacher limped home ninth, out of the points which pleased Alonso. However, with Robert Kubica's BMW-Sauber excluded from seventh place for being underweight (on the Pole's GP debut), Schumacher was promoted to eighth which gave him a point, leaving him just 10 points adrift of Alonso.